Winter makes me sleepy <insert yawn here>, not to mention stir crazy . I find myself yearning for change. I have been known to sand, paint and rearrange any and all furniture that I can get my hands on. I paint as many rooms as I can with any and all paint that I can find. As you can imagine my home becomes quite a parade of projects. My poor family suffers through them until my creative tornado winds down and in a moment of exhaustion I flop onto the couch and curl up with my stacks and stacks of unread magazines-which eventually refuels my imagination and my maniacal cycle begins yet again. or cabinets of fabric (*ahem* even though I can’t sew). This is why I have 152 craft cabinets. This is why I live on Starbucks. You see my darling sister Marcey lives in the most adorable house nestled in one of the most charming suburbs in town. 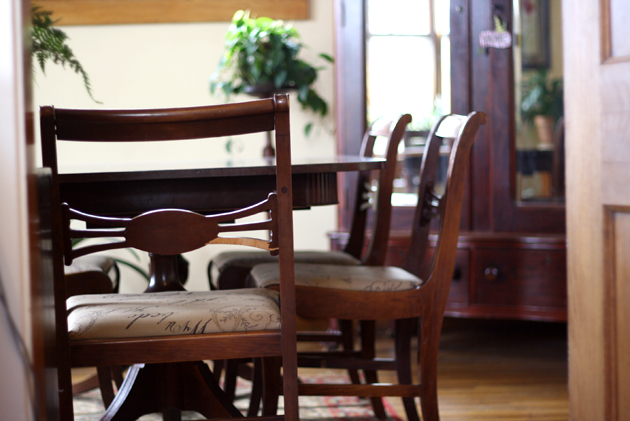 Her home is warm, equipped with a delightful front porch, hardwood floors and tidy rooms full of antique furniture including the chair I gave her when I moved to Atlanta (but that’s story for another day). Marcey has the loveliest dining room table that has the most precious chairs tucked around the edges that patiently wait for me and my family to invade her delightful home for various family/holiday/birthday gatherings. For years my sister has been talking about covering her dining room chairs each time we gather around her lovely table. So for Christmas, I took it upon myself to buy her some fabric that I wrapped along with a note promising to help her cover her seat cushions. A few weeks ago I ventured over with my staple gun on my hip and a Starbucks in my hand. 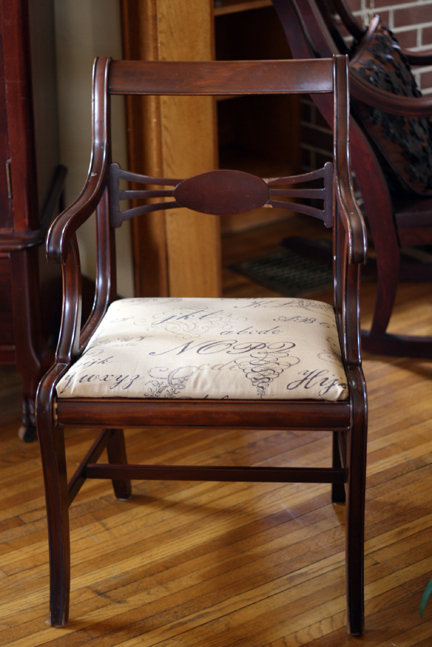 Wait ’til you see how easy it is to give your chairs (and room) a new look! No parade of paint brushes or messy makeovers here. Just some fabric, scissors and a staple gun. And of course a chair with a removable seat cushion. 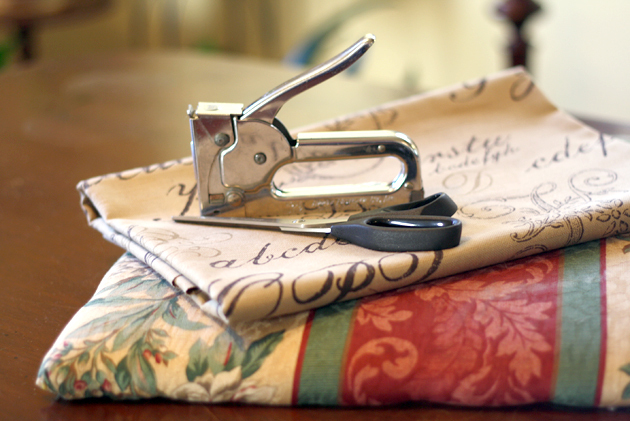 First you’ll want to iron the fabric to remove any creases. Next, place your fabric on a flat surface and cut the (ironed) fabric into squares that are a couple of inches wider than your seat cover. 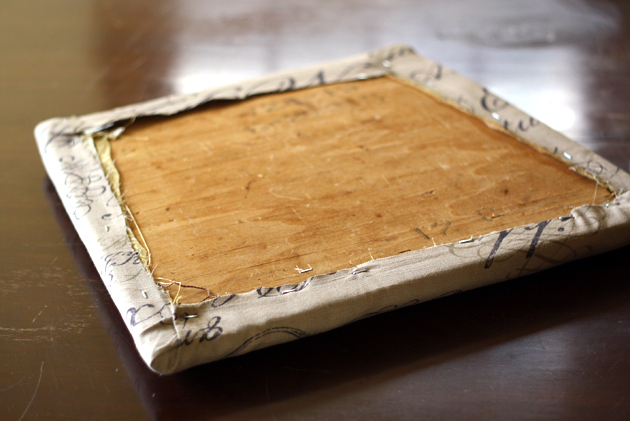 and neatly fold the remaining fabric from the other side over (like you would when wrapping a present). And then staple that into place. I am no professional seat coverer by any stretch of the imagination, however I have found that less is more when covering seat cushions. 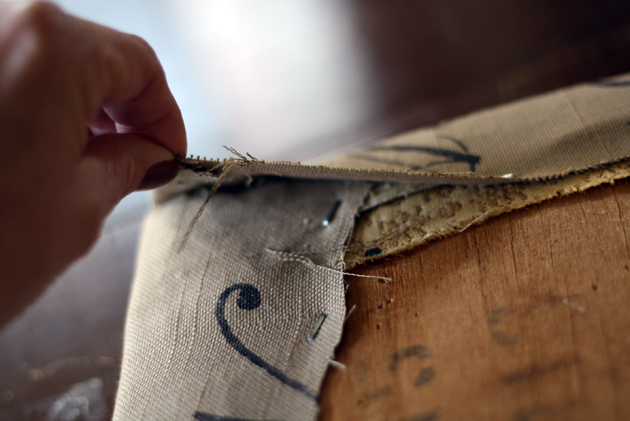 If you have too much fabric or too many staples the seat cushions will not fit back into the base of the chair. 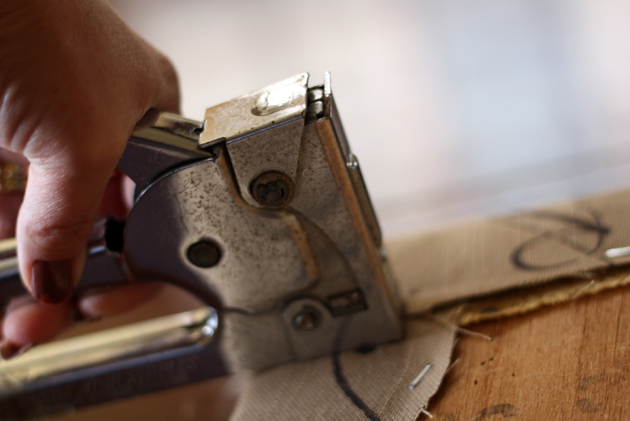 If you do use too much fabric or too many staples you will just have to keep trimming the fabric off, take all the staples out and do it all over again until the seat cushion will nestle back into place. I may or may have not done just that a few hundred times. 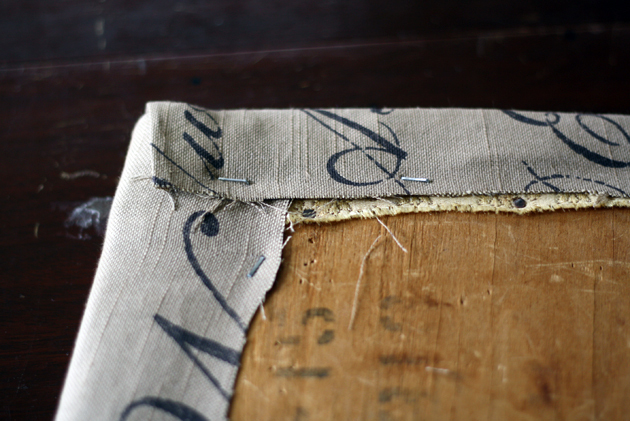 Continue stapling and folding until the entire edge is stapled and all of the corners are nice and neat (and flat). Then place the cushion pack into the chair. And sit on it a few times just because you can. You’ve got yourself a new chair and not a bead of sweat to be found! Not to mention a whole new room with a whole new look and feel. Now if you’ll excuse me, I’m having new-seat-cover-envy. Time to grab another Starbucks and get busy stapling and folding to at my house. Oh, I love it!!! I was just thinking about recovering our kitchen chair seats the other day. 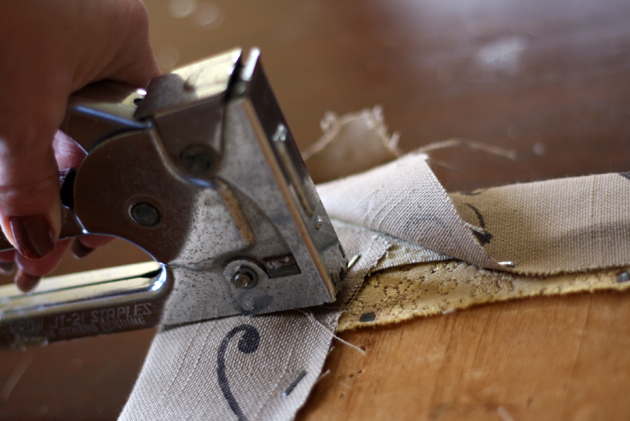 Here’s how it normally happens….I buy the fabric and my husband ends up doing it. 😉 I still drink the Starbucks. Good tip! I’m mighty handy with a staple gun and have covered a few myself. 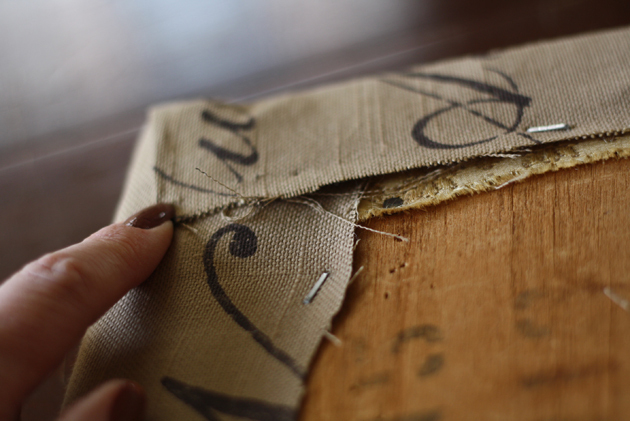 When you’re indecisive like me or tend to change your mind a lot, inexpensive fabric and staple gun skilz come in handy. I just love the fabric that you chose! And your sisters table is lovely. I am notorious for changing my seat covers. 😀 Good thing my guy is easy. I love the fabric you chose for your sister’s chairs. I’m sure she just loves her *new* diningroom! Gorgeous, Wendy. I have some chairs that need updating pronto that I need to get on! You are so darn talented, Wendy. 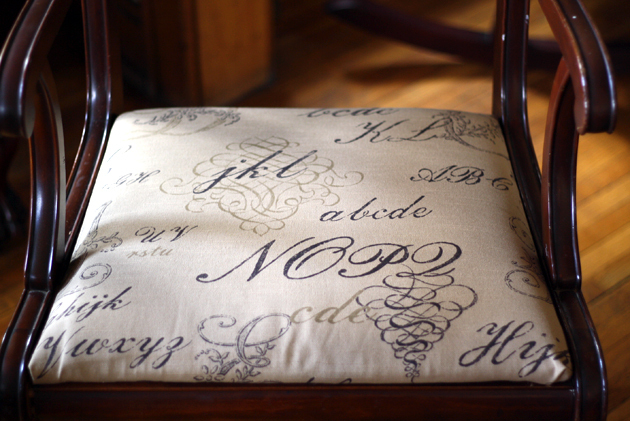 I would never even consider that I could do this project without the help of an upholstery store. What a lucky sister you have! It is a beautiful diy chair cover! What a beautiful, quick change. The fabric reminds me of *Paris*. Beautiful choice. 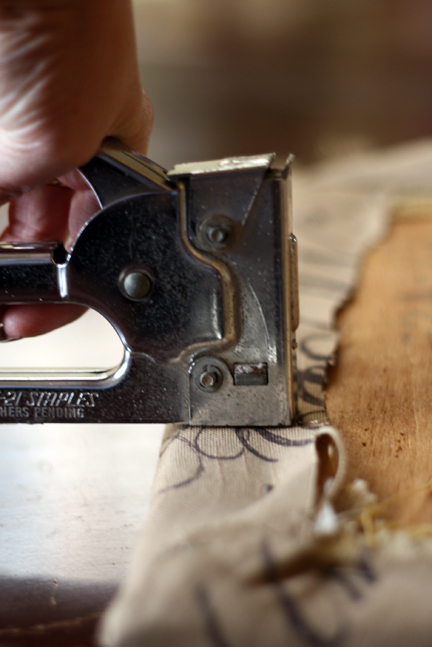 Staple guns are the best-est, aren’t they? I use a small red one ( easy to find at the hardware stores), it is strong and mighty, but easy on the hands. My contractor and the guys around the house NEVER STEAL it, since it looks ‘lady like’. haha, perfect. I can relate to you in some level I cant stop wondering around the house and thinking of the new proyects i can get my hands on. but this one is by far the best one I cant get my hands starting on. I love this fabric! My mom taught me how to do this when I was younger and I thought it was so fun.